HomeblogAre you ready for a robot that learns on the Internet? Are you ready for a robot that learns on the Internet? 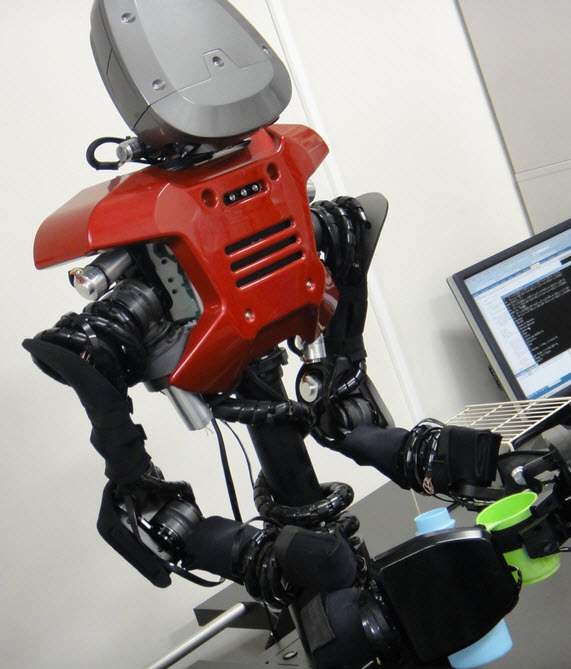 A humanoid robot that “learns from the Internet and from other robots” and can “think, learn, and act by itself” has been developed by the Hasegawa Lab at the Tokyo Institute of Technology, DigInfo TV reports. OK, this is freaking me out just a little. I don’t want a bot that learns on the Internet how to make me green tea (see video), OK? Call me paranoid, but what if it visits a site called “How to poison a human by spiking their green tea” and doesn’t have “poison = no no” coded in memory? I’m thinking a re-read of Asimov’s Three Laws of Robotics in iRobot is in order right about now. This thing uses a “self-replicating neural network,” or SOINN (Self-Organizing Incremental Neural Network), which is an unsupervised (learns by itself) online-learning method. Apparently, it can make “educated guesses” (oh, oh) and decisions based on its past experiences and knowledge. For example, if the robot is told that cold water is wanted, it recognizes that after pouring the water, it can’t pick up ice straight away, because its hands are already full with the glass and the bottle. So it chooses to put the bottle down, and then put the ice into the glass, the video explains. That’s all good, but check the video: the bot is making tea by pouring orange pills or something into the cup instead of water and it’s picking up a blue “ice cube.” This can’t be good.